I've written about the Northern Lights (Aurora Borealis) before, but the last was in Iceland. I recently had the great privilege to travel to Sweden above the Arctic Circle on assignment for Nat Geo and go dog sledding (which is one of the most fun things I've done in all my travels….and another story for another time). I had expected to see the Northern Lights while in the far North of Sweden. But what I hadn't expected, and what ended up happening, was a nightly show of this beautiful nighttime phenomenon. Yup, that’s right…I am sorry to rub it in, but I saw the Northern Lights EVERY night on my trip. I couldn't believe it….what luck! If I can diverge for a second…bear with me. The first time I went to Tanzania, I was camping on the rim of Ngorongoro Crater, and I remember getting up in the middle of the night to go pee. While I was peeing, I looked up and there, in the window in front of me, which was completely open and was basically three feet from my face, was a zebra looking at me and watching me relieve myself. I remember thinking: “Now that’s East Africa. A guy can’t even take a pee in the middle of the night without seeing some wildlife.” Why do I bring this up now? Now, you would think that, because I saw the Northern Lights every night I HAD to come back with at least one good shot, right? Well, not really. First, in order to get this shot, I had to stand in minus 20 degree (Fahrenheit) weather for hours at a time. That’s COLD! I wasn't even sure if my Canon 5d Mark II camera would operate at that temperature (Canon officially rates it to operate around +30 degrees Fahrenheit). Turns out, my camera worked great (despite a very short battery life in such cold weather). And then there’s the issue with the motion of the Northern Lights, which move and transform quicker than one might think, and make long exposures sometimes challenging. All in all, it wasn't easy…but as photographers we aren't allowed to make excuses, just make pictures. I really like this shot for many reasons. First, I like the warm glow of the sauna against the chilly snow. (yes, that’s a sauna…and yes, I did go into it after spending hours in the freezing cold taking this shot). 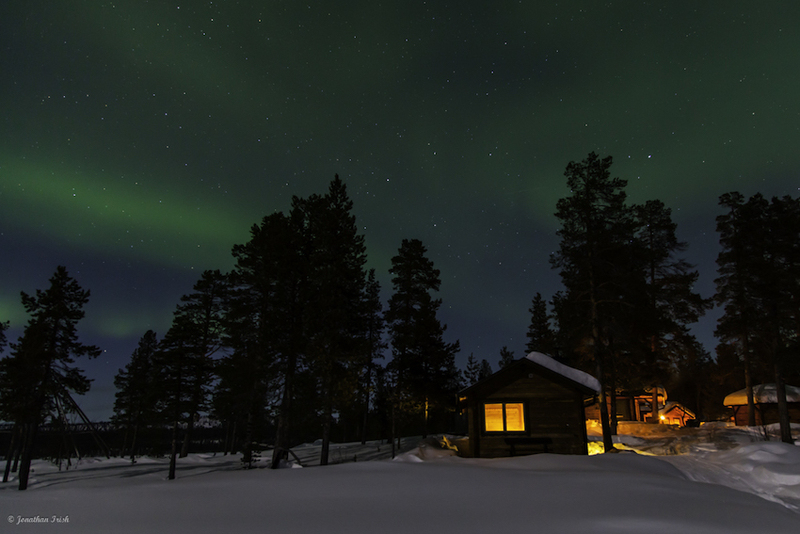 The warm glow of the sauna brings life to the image….it’s not just trees and sky, people actually live here. I also like the trees framed in front of the Northern Lights in the sky. Somehow, both the Northern lights and the trees are accentuated by their placement in the image. Which, by the way, is something I learned when shooting the Northern Lights….having a good foreground is really important. Lastly, I love the Northern Lights themselves, with the stars in the sky. It’s an ethereal view, right? Have you seen the Northern Lights? If so, where? And if not, when are you planning to? Gotta check this off the life-list….they definitely live up to their reputation. 16 Responses to "The Northern Lights of Arctic Sweden"
I’ve seen those lights in the northeast part of Norway, there was spectacular view! I hope to see them one day soon. Wow, Northern Norway must have been amazing. You are right about one thing – you were extremely lucky to see the Northern Lights every night. I spent over 30 days in the Arctic in the last year and have seen them for a total of 3 times and all for pretty brief periods. It takes a lot of dedication and hours of standing in the cold to capture them. Wow! 30 days in the Arctic, that’s amazing and only 3 times seeing the Northern lights. Okay, Jonathan was extremely lucky. I have seen the Northern Lights in Canada, and I can’t get enough! It sure it difficult sometimes though, it was freezing cold and you really need to watch the sky for the changes, you might miss something really cool if you’re inside sipping hot chocolate! I would love to jump into the sauna in your photo, it looks so inviting in the snow with the warm light coming out of it in the night. Awesome! We can’t wait to finally see the Northern lights this year, we’re heading to Greenland in August, I hope we have some luck on our side! Beautiful! How fortunate you were to see them every night! I’ve read that weather conditions have to be just right and that many a traveler has gone to see them and been disappointed with nary a sighting. This is high on my list and I only hope I’m half as lucky! I hope that we get to see them one day soon too. Jonathan took a great shot indeed. which part of Sweden were you when having this remarkable nature wonder? I'll have to ask Jonathan Irish that question, hopefully he'll take a quick look soon. That’s a beautiful photo you have right there. I admit your zebra story made me laugh, honestly, it’s so awesome how things like that happening are considered normal in tropical countries compared to a non tropical country. Anyway.. it’s a place I’d like to add to my list too.. I’ll keep following your travels.. thanks for the update.. The northern lights are beautiful. I hope I get a chance to experience these some day. They never seem to look the same in the photographs so you could look at them every day and see something different. Incredible colours. I hope to see this awesome natural phenomenon at some point on my travels. It’s right at the top of my life list!